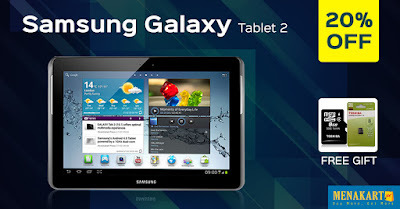 Samsung Galaxy presents the Tab 2 P5100, a powerful tablet that runs on the Android 4.0 (Ice Cream Sandwich) operating system. It is powered by a dual core processor and has 1 GB of RAM. This tablet can be used for voice calling, video calling, playing songs and indulging in social networking. The main features of the Galaxy Tab 2 P5100 are the dual camera, large display screen and a powerful battery. This tablet comes in a lightweight and sleek body that is white in colour. The display screen has a size of 10.1 inches and a resolution of 1280 x 800 pixels. The multimedia highlight of the Galaxy Tab 2 P5100 is the 3 megapixel primary (rear) camera, which comes with multiple photo effects like Gray, Negative and Sepia. There camera boasts of Geo-tagging, Fixed focus and White balance as well. File formats like ASF, AVI, MP4, WMV, FLV, MP3, WAV and WMA can be played on this tablet. ConnectivityThe wireless connectivity options on this tablet are 3G, Bluetooth and Wi-Fi. Voice and video calls (through the 0.3 megapixel secondary camera) can be made with this tablet. The Galaxy Tab2 P5100 from Samsung comes pre-loaded with Google Plus, Samsung Kies and ChatON messenger. Battery & StorageThis tablet has a powerful 7000 mAh battery that provides a long operational time. It boasts of an internal storage capacity of 16 GB, which can be expanded up to 32 GB with a microSD card.